Internet and Text Message Slang is becoming more and more a part of everyday life. Do you have trouble reading what your children or your friends are texting you? Don’t pretend to know or be forced to goto the nearest computer to look it up. Text Decoder can get you the answer in seconds. 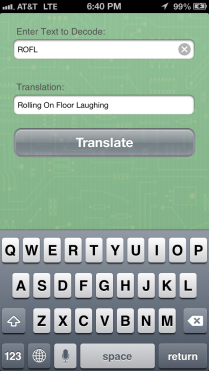 Text Decoder has the largest SMS, Text, & Internet Slang database of all iPhone and iPad apps. 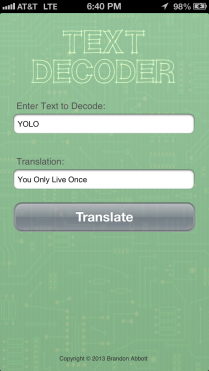 With over 7,000+ terms Text Decoder can decode just about anything! No annoying searching or scrolling through 1000′s of terms. Simply type the term you are confused about and press “Translate”. Text Decoder instantly searches it’s internal database so there’s no need or wait for an internet connection. Text Decoder supports over 100 different “smilie faces” as well. Parents: Concerned what your children are saying online? Do you see cryptic codes and messages when you walk in the room? Learn what these mean and make sure your children are being safe!